Fumi's Blog: #cfasummit "How Googlers helped San Francisco Use Data Science to Understand a Surge in 911 Calls"
#cfasummit "How Googlers helped San Francisco Use Data Science to Understand a Surge in 911 Calls"
On 9/30-10/2 (next Wed-Friday) Code for America Summit will take place in Oakland. It is an awesome conference in the civic innovation area, and we are happy that Google will be sponsoring the summit again. This year, I will be moderating a panel to talk about a project that I have been working on with the San Francisco local government for the last year, called "Civic Bridge". At Google, we provide many products and services to contribute to the society- for example, services such as Google search, Google Maps, Gmail, YouTube and Google Calendar are so useful to my life that it has been a game changer for me. Maybe you have your own favorite. Yet, I felt like there are much more Googlers can do to contribute to the society, and when we started to talk internally, many felt the same way. There are various problems in the society. San Francisco- the city I live in is an awesome place, but we do have housing issues, safety issues, homeless issues etc. Any city has its own problem, and the mayor and local government employees are working hard everyday to help solve those problems for us. What if technology company employees worked together with those city employees to help solve those problems? Through Civic Bridge program, Google employees worked with the San Francisco city employees for 4 months as pro-bono volunteer project, 1 month for full time and 3 months as 20% project. We wanted to tackle hard problems that may take 10-20 years to resolve, and think about how technology can help resolve those issues. Not just doing a system change to existing system or making a simple website, but we wanted to tackle hard problems. We also wanted to make sure we are making meaningful changes to impact the citizens' lives through Civic Bridge. It took a long time to prepare for the project- from negotiation with the city, getting the contract signed, working with Google's legal department, scoping the project, selection of Googlers to work in the city, managing the project, etc... and we have finished all the preparation in March. 6 Googlers started their engagement in the city from 4/1 and finished the projects at the end of July. 3 Googlers worked on Affordable Housing project, the other 3 Googlers worked on 911 call analysis. At Code for America Summit, I will be moderating a panel with the 911 call analysis Google team and SF city staffs. Abstract: This year the San Francisco Mayor’s Office of Civic Innovation piloted a program called Civic Bridge to bring pro-bono private sector experts in to help City departments with pressing challenges. Googlers made up 2 of the 4 teams that worked with San Francisco City departments on issues like affordable housing, emergency response, City hiring, and homelessness. 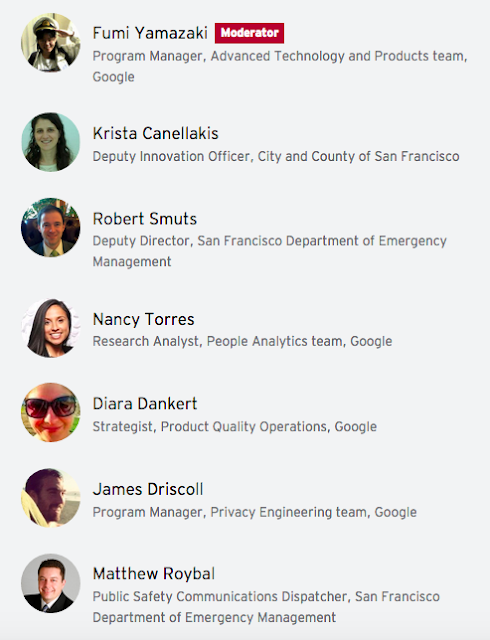 At this panel discussion, panelists from Google and the City of San Francisco will share the experience of one of the projects, in which a team of Googlers brought data analysis skills to the Department of Emergency Management to help SF understand their recent dramatic increase in 911 calls. We really hope that more efforts for the city governments and local tech industries to work together to resolve local issues to expand to many cities with many companies in the future. If you are joining Code for America Summit this year, please join our session on 9/30 2-3 PM in Room 203 (there is no livestream nor video recording) to hear more!